The Sky Island suburban area features large, upscale single family homes for sale built in the 2000's. This is a group of subdivisions near Sky Island Dr. E. off of SR-410, just south of the action and amenities of Bonney Lake and Sumner. It is a great spot for commuters to Puyallup, Tacoma, and Joint Base Lewis-McChord (JBLM)! 4 Beds | 2.5 Baths | 3168 sq. Ft.
4 Beds | 2.5 Baths | 3400 sq. Ft.
4 Beds | 2.5 Baths | 3114 sq. Ft.
5 Beds | 3.5 Baths | 3444 sq. Ft.
5 Beds | 4 Baths | 5295 sq. Ft.
4 Beds | 2.5 Baths | 3520 sq. Ft.
4 Beds | 2.75 Baths | 3018 sq. Ft.
Blue Summit Realty has the most accurate and up to date Sky Island real estate listings on the web. Currently there are 8 homes for sale, and 2 vacant land properties in Sky Island. Of the 10 total Sky Island residential listings for sale 0 are bank owned, 0 are short sales, 0 are new construction, and 0 are townhomes. The price ranges from $474,999 to $0 with a median list price of $654,971 and median sold price of $555,760. 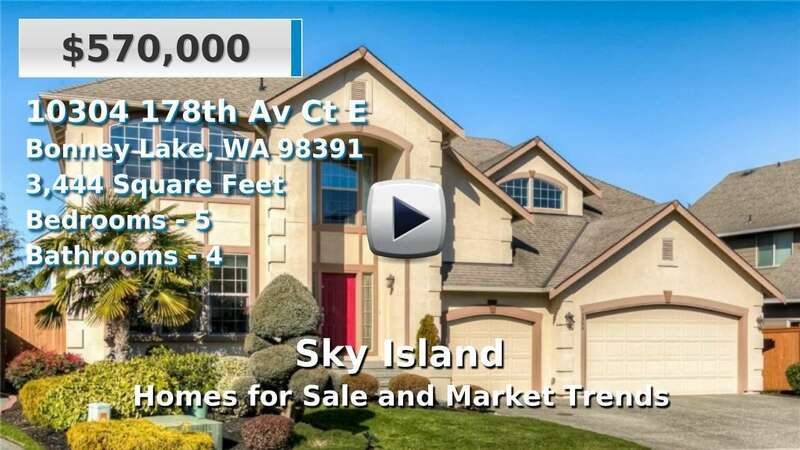 Make sure to refine your Sky Island real estate search by property type, price, square footage, bedrooms, bathrooms and more with the search tool above or view the Sky Island listings on our interactive map. Our Sky Island real estate listings were updated 2 minutes ago.